Would you like that little bit longer in bed in the morning, with your own double bed and with free rein of the bathroom..? Or that extra luxury in your own private room for when you are outside of classroom hours..? 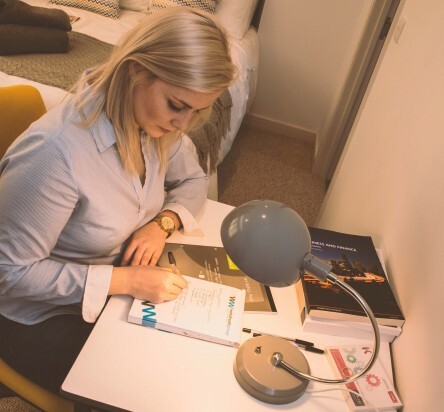 During your next stay with us, treat yourself to a stay in one of our new premium rooms to help ease the stress of studying. All rooms in our newly refurbished 2 Church Close come complete with Wi-Fi, private occupancy, large study space and double ensuite bathroom and shower. Within the house there is also a Lounge area where you can relax and wind down with some television after a day studying. The houses are located opposite the church and are a short walk from the Business School. Take a look at the gallery below and contact us to book your place! In part two of our Managing Meetings follow-up, this week we’re looking at one-to-ones, and how to get the most out of them, whichever side of the table you’re on. Here are our top tips. We received a fair amount of interest in our recent post about CPD training and managing meetings, we thought we’d share a two-part follow-up in the run up to our course on the topic this week. We offer entry level courses which can advance your career or provide entry into more advanced professional qualifications. © 2019 REED Business School. All rights reserved. All profits are covenanted up to a registered charity. Reed Business School is a trading subsidiary of Reed Educational Trust Limited which is a registered charity. Registered Charity Number 328347.